Books and stuff for those not afraid to think and laugh at the same time. It's the moment all you Nookers have been waiting for: Muffin Man is now available on the Nook, in addition to Kindle and paperback. John Lawson, sheriff of the quiet Hill Country town of Bolero, Texas, attempts to quell a feud between the local megachurch and a construction contractor, but it escalates from picketing to vandalism to arson. The case is derailed by the unwelcome return of John's free-wheeling bipolar father, who arrives in the same red Mustang he drove away twenty-four years ago when he abandoned the family. But ultimately it is the muffin that his overzealous deputy bags as evidence that threatens John's ordered life, possibly beyond repair. Brad Whittington is not only back, he’s at his best. I haven’t been this excited about a new fictional detective since Martin Walker’s Bruno, Chief of Police. 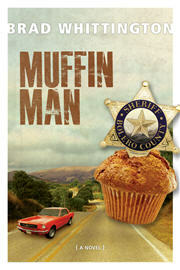 Have no doubt: Muffin Man delivers! Whittington has baked up a winner in Muffin Man. With dry wit, poignant humanity, and a setting as rich as Texas earth, Whittington proves his fl air for storytelling once again. A great book. After six years of silence, Whittington’s highly anticipated entrance into the general fiction market combines his considerable storytelling talents with influences as diverse as Richard Russo and Michael Connelly. Muffin Man strikes a balance between comedy and drama and takes the trademark Whittington elements of rich setting, engaging characters, and turn of phrase to a new depth. Wunderfool Press is the home of entertaining books for folks with a brain and a sense of humor. Not necessarily in that order. Keep on rocking in the free world. On a stick. StupidInternetTricks.com started here but migrated.